It is a commonly accepted notion that the Christian church is in a tailspin. Almost every week a new article or blog surfaces (See HERE, HERE, and HERE, for example) which read, “The sky is falling! The sky is falling!“, but at the end of the day, I’m ignoring those fearful chickens. Sure, I know of some churches that are in a decline, but I also know of many others that are flourishing. We all are well aware that statistics can be spun many directions, but even the stats on this are ultimately indecisive. For instance, church attendance for a single Sunday may be as low as 25% of Americans, but if you were to check over the course of a month, attendance/involvement would climb to upwards of 40%. In fact, the number of self-identified Christians in America has fallen a mere 10%, now hovering around 75%. For one, Modern Christians – for the most part – have realized that a building the church is not. With their busy schedules, they aren’t afraid to miss a Sunday or three if that’s how the cards fall. So, though they would definitely still call themselves Christians, & even active in a local church, unlike 20 years ago, it’s very unlikely the modern church member will be there every Sunday. That obviously will influence the data towards decline, if you want to spin the numbers that way. But it doesn’t mean that there are fewer Christians. Secondly, the further we move into an all-immersive technological age, the less the church building will be the cultural hub of a community. At one time, church members attended Sunday morning, came back together on Sunday night, met for Bible study on Wednesday, & came to monthly events. Now many Christians get the “meat” of the Bible teaching online, the community hubs revolve around favorite sports teams, & their children’s clubs/events, & the primary fellowship happens with like-minded Christian friends in the back yard, around the kitchen table, or scattered across the living room floor on a Friday or Saturday night. In fact, I know a great many solid Christian friends of mine who have stopped doing the normal “church” thing altogether, choosing instead to fellowship with the people they weekly invite into their homes & lives, forming their own Christian community – their own church, of sorts. Thirdly, given Atheisms’ recent ‘marketing campaigns’, making it possible to openly espouse unbelief without immediately being suspect of child molestation or serial murders, those raised in the church who used to just “play church” in their community for the sake of fitting in, no longer feel the need to do so. That’s not an honest decline – that’s just apple & oranges, & the oranges are no longer pretending! Lastly, the only clear, proven decline in membership is of denominational churches, and of those, most drastically the more liberal leaning of the bunch. So, churches more concerned with being A) social clubs that have long stopped being concerned with the “Jesus Myth” (at least, what they honestly see as a myth), or B) the guardians of a specific group of traditions, over and even against being concerned about Jesus… those churches are dying. Are we surprised? A bar is also a potential social club, & is far more interesting than most churches, & unless one likes history & is an employee of a museum, for the average American guarding traditions is pretty low on the totem pole. As people who concern themselves with those sorts of things die off, those churches will fade. And those “churches” – if we can Biblically call them that – need to go. That was never what the church was intended to be. When I look around me, I see new churches & church plants, full of people excited about Jesus, the Gospel, & the Kingdom of God, making huge strides, gathering momentum, impacting others & their communities with the powerful truth of the Gospel. I see those churches growing – adding to their numbers weekly. And, worldwide, Christianity is still by far the fasted growing religion – non-denominational charismatic Christians in particular are spreading by upwards of 8% annually, & in China – the largest nation on Earth – there are currently more “underground Christians” than Communists, and it’s a Communist country! No, the church is not dead, nor is it dying. It may go through some growing pains, but in the end I know all will be well, because Jesus made a promise to Peter, & to all of us as well. He said, “…on this rock I will build my church, and the gates of hell shall not prevail against it.” (Matthew 16:18). 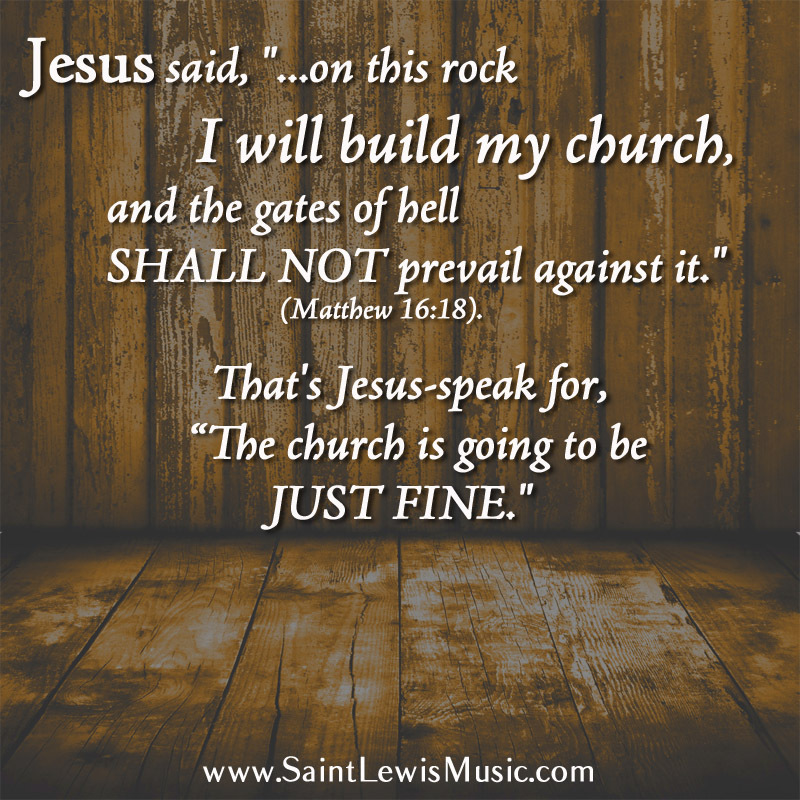 That’s Jesus-speak for, “The church is going to be JUST FINE.” You see, “this rock” was Peters confession of Jesus as “Savior“, & “King” (that’s what “Son of God” means in Bible-speak – “Son of Man”, on the other hand, means Divine Being – it can be confusing, I know) – those are the foundation stone of Christ’s church. And Jesus promised that she would be triumphant – not even HELL could fight her back! So, I’m not too worried – I think Jesus’ church is going to be just fine. Let’s speak with honor, & not name any names, but what do YOU think about the current state of the church? When the religious people were appalled by Jesus willingness to allow the people to cry out HOSANNAH! as he entered the City of the King on a donkey as the prophets of old had foretold, he said the rocks would say it if the people didn’t. The Church is alive. The Church, like the cells in our body, is a collaborative effort of living producers whose purpose and function are to work in harmony to create an environment where God is pleased to dwell in and through each one of us as we play each one of our divinely appointed, eternally essential roles. The gates of Hell will not prevail against our Body, Christ’s Body. Seeing Sam Harris and Richard Dawkins and the chorus of those who just may be among those created for destruction if God has willed it, going out into the Agora today and rallying the soon to be destroyed seducers of the world is a blessing and not cause for behaving like an Ostrich when the pressure is on. God is calling the roll. Those with ears to hear and eyes to see will be revealed just as those whose hearts are made of nothing more than vitamins and minerals, rocks basically, who do not join us in our Heavenly duty and joy are being revealed too. Both types of people are growing bolder and more confident with each passing moment. We as the living Church have accepted our place through humility and repentance in order to achieve hope that sets our foundation in this life and the life that is promised when our testing is completed. For those who are perishing, their choice to reject our fellowship with the Living God is nothing we can understand this side of the uncovering. We can only love those who rejected Jesus, like his own family did, hoping that someday, somewhere, before they join us God willing, they too will choose on their own to surrender their will back to the one who gave it to them, trusting that His Will is better than any creation, invention or idea ever conceived in the mind or heart of any creature. Things are good. They are getting a whole lot better though. You may suggest that I’m proclaiming “the sky is falling” but I do think the modern American church is in need of significant reform. You provide some statistics regarding church attendance, but I don’t think attendance is the problem. The problem with the church in America is one of CONVERSION. People who have been converted as a result of the regenerating Spirit of God make up such a small portion of those who are self-identified as Christians. The problem is that the gospel has become so inclusive by watered-down theology that we’ve succumbed to decisionism and “inviting Jesus in my heart” that there are far too many professing Christians in America who remain unconverted. For example, children are raised in the church community, are told that they’re little believers, and if they keep those Church-based social ties as adults, then they’re ostensibly Christians. The problem is that our churches consist of too few regenerated individuals. Professing Christians can learn the language, the lifestyle, then seek leadership positions, all the while remaining unconverted. This leads to a watered-down Church, one filled with tares. The Christian movement in China provides genuine consequence to identifying one’s self with Christ. The consequence of professing Christ in America is of little detriment. It’s socially acceptable. In some respects it’s more socially unacceptable to NOT profess Christ than to do so. When/if the American Church suffers true persecution, I’ll think we’ll be surprised by how many flee the church community. Today, it’s comfortable to be part of the church community. The social acceptability of being part of a church community leads to great complacency in the church at large. Another issue is that the church has become an institution, whereas the Body of Christ is a living organism. Of all the good, beneficial, needful changes as a result of the Protestant Reformation, there was yet more that needed reform. The 1st Century apostolic church was not an institution. It was a body of believers. We, in Protestantism, have continued to treat the church as an institution (something that the Reformers supposedly reformed from), resulting in so many varied denominations and even many different sub-denominations within a denomination. What if we actually got back to our roots? Instead of sharing with others the name of our local church body of which we are members, what if we identified ourselves simply as a member of Christ? What if we found it unnecessary to provide a name for our local church gathering because we are simply: the ekklesia of God. My heart has lately been led away from institutionalized church and leaning more towards home church fellowship. By the way, bro, as I’ve been typing this my children have been dancing to Danielson “Did I step on your trumpet?” Good times!